TREE SHADED CORNER HOME!!! Covered entryway with red metal front door welcomes you inside to painted living room has newer weathered wood-looking linoleum throughout living room, kitchen and hallway. Ceiling fans, lighting fixtures are new including kitchen recessed lighting. 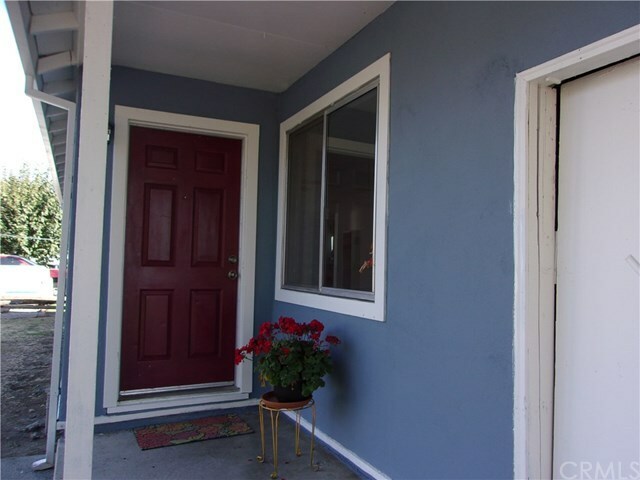 Three bedrooms have recent carpet and paint. The one bathroom is newly enlarged and recently remolded with pedestal sink, tub-shower combo, storage unit, and new linoleum. The kitchen has eating area, dishwasher, gas stove, open cupboards, refurbished wood bottom cabinets. A door to garage for easy unloading of groceries from garage to kitchen. The one car garage has laundry hook-ups, gas water heater and a new metal door to the West to expansive backyard with many possibilities. Be shaded in the summer with the mature trees and use your imagination making the 8'x8' poured cement slab just waiting for your creative ideas such as a fire pit for entertainment or that hot-tub you have always wanted. Exterior roof is newer with rain gutters, there are dual pane windows with newer screens. Home is located close to WILLOWS Intermediate School and Central Park. Come fall in love with this home. Buyers to investigate conditions to their own satisfaction, measurements taken from public records.